This is the first piece of my “Frosted Glass” series, and focuses on the Jill's life as a mother. She spoke of how she tried to keep her addiction away from her children and one method of this was by spending money on toys to keep them busy while she was using crystal meth. I began to reflect on what the norm and ideal is of mothers, and immediately I thought of the Madonna. She is representative of pure love, and I drew connections between how the interviewees children might have thought of her when getting luxurious gifts, and juxtaposed that ideal with the reality. In many classical depictions, the Madonna has an elongated waist, which I chose to connect with the dramatic weight loss Jill experienced, as her doctors showed much concern for her health due to how underweight she had been after admitting herself to a recovery program. This piece does not focus on Jill, but instead on someone she knew. She spoke of hearing about a friend's death on the news. He had stolen a car and was pursued by the police, including a K-9 unit. Jill's acquaintance shot the police dog, and was shot by the police after. The dog lived, but he died. I had this clear image in my head of the adrenaline of the entire situation; the two animals with one of the most basic instincts: fight or flight. One had the duty to fight, the other was attempting flight but wound up fighting. 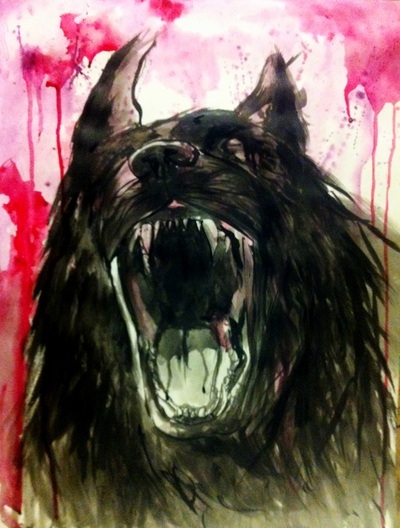 The man was like a cornered animal and was lashing out, just like the dog. I couldn't help but begin to equate the two and their primal impulses. 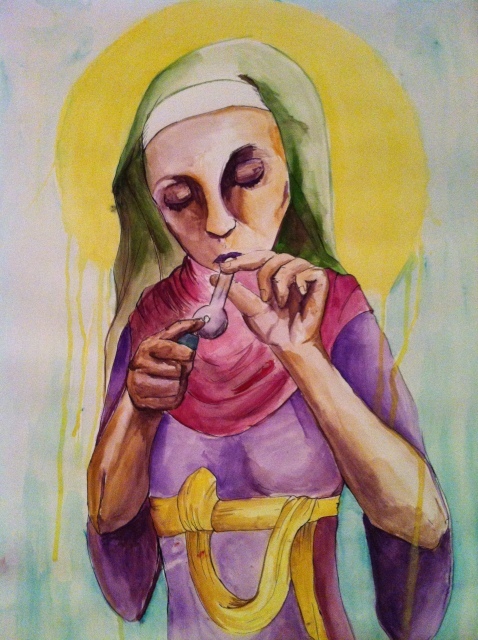 For this piece, I decided to work on something more positive from the transcriptions; I had no intent on making each piece related to the frightening or uncomfortable side of the interviewees addiction because I felt it would discount her struggle as well as her hard-earned sobriety. In the first interview, Jill talks about how her life had been so consumed by her addiction that she slowly stopped eating until she had only the most tenuous grasp on how to eat. When she entered a rehabilitation facility, she recalled seeing a plate of pancakes on her first morning and how they roused her appetite, though she had all but forgotten how to eat them. She describes a woman sitting across from her offering to show her how to eat, and how she helped her to cut, chew and swallow her food (1: 557-573). To me, that reading about that plate of pancakes was more than just breakfast, it was a time in Jill's recovery process that helped to ground her. She had forgotten one of the most basic human needs because she had become so consumed with her addiction, but even then she was not alone. 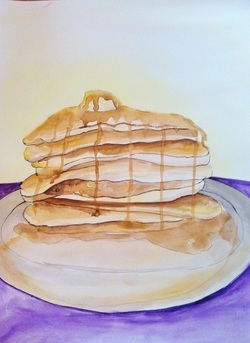 I tried to think about what would make pancakes look so appetizing, and what I wound up with was a stack of golden-brown flapjacks, with a huge pat of butter on top and generously drizzled with a thick syrup that just clung to the batter as is slowly rolled down. When I read these interviews, I really only have my own imagination to fill in the gaps of what I'm reading. My mind took me to wonder if Jill struggling to eat the pancakes could be representative of her struggle with overcoming her addiction. As she slowly climbed back to sobriety, she learned how to function just as she had before her addiction took hold of her life. When reading the transcripts, I was drawn to Jill's mention of her illegal activities, including dealing drugs for the Mexican mafia. 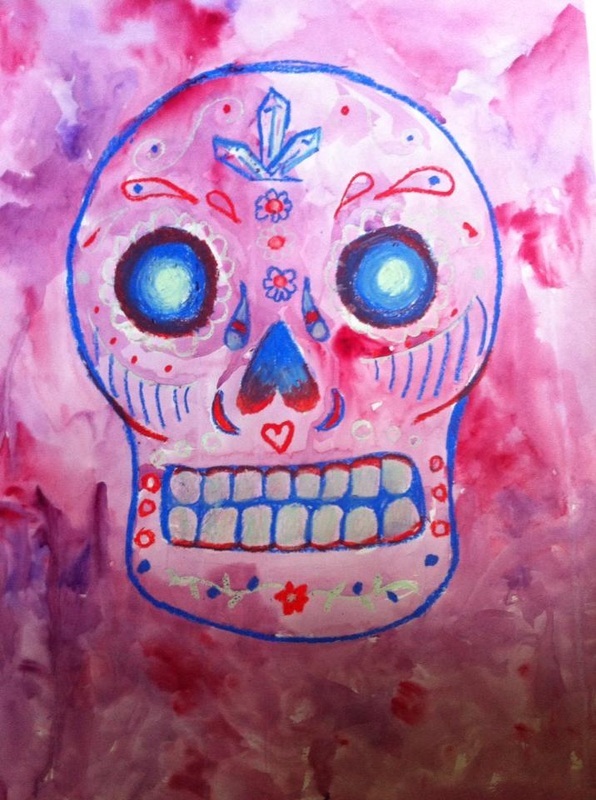 I made the connection between her experiences and the sugar skulls that are integral in the Mexican “Dia De Los Muertos” (“Day of the Dead), which is to celebrate the lives of loved ones who have passed. I thought about Jill and the metaphorical “death” of her former self before her addiction. Traditional sugar skulls have a lot of intricate detail and designs, and when I began to do the small detail to build up on, I continued to make connections between how I was decorating this skull and how physical appearance changes in long-term heavy meth users. The red circles are representative of meth sores, a common physical effect that occurs because of many different factors such as poor hygiene and picking at the skin. The lines beneath the eyes and the red continuation of the cheek bones are meant to appear similar to the gaunt or emaciated appearance that is widely connected with heavy drug use (though some people do bloat). The crystal on the head is the representation of the physical appearance of crystal meth. At first, I was not sure how to depict it, and chose to go for an easily recognizable design. So far in the series, I have chosen to use primarily reds and purples as the main colours. The red is the aggressive and dominating nature of addiction, while the purple is the struggle towards sobriety. I feel together, the colours can be striking and create visual interest. Birds and animals have always been a subject of interest to me. I love the symbolism attached to animals and how it can vary from culture to culture and even change from positive to negative depending on where you go. Crows and ravens especially have a very cultured history- from messengers of death to the personal eyes and ears of the Norse God Odin. In this instance, I've chosen to use the idea that crows are related to disease and death, in this case, Jill is the crow and she is chained to her addiction. 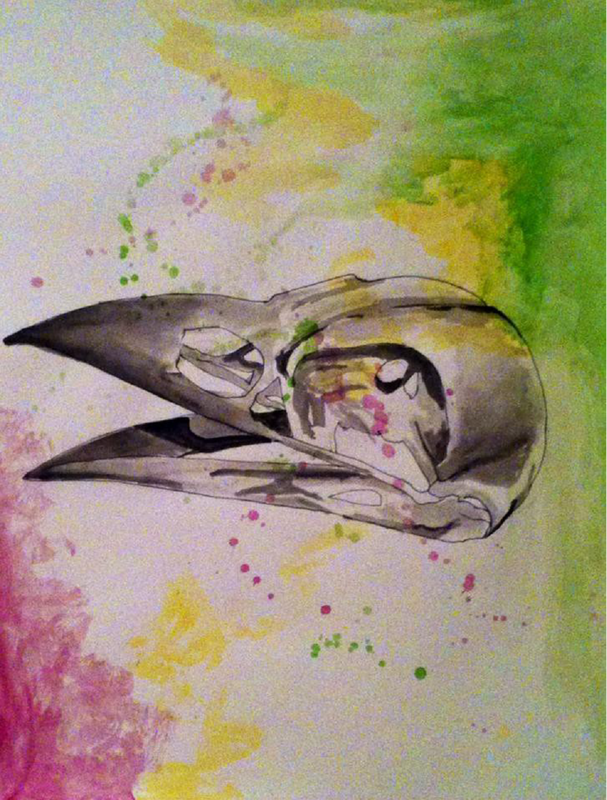 Because crows are often thought of as vermin, I chose to portray her as a crow, an image of a social pariah. Struggling with the disease known as addiction can be like literally being chained to that lifestyle. Though she is technically free, she is still essentially bound to her ultimately destructive lifestyle. For this reason, I chose to portray the crow as on a wire as opposed to in a cage; I wanted the illusion of still being in the outside world and reality rather than secluded. The truth is, crows are just birds, like others. There are other birds that eat carrion, that make noise, but because of their historical connotations, they are looked down upon by many. Jill is not beyond redemption, and though her struggle it may seem like her freedom may be beyond her grasp, it isn't; she can still escape the stigma's placed upon her. 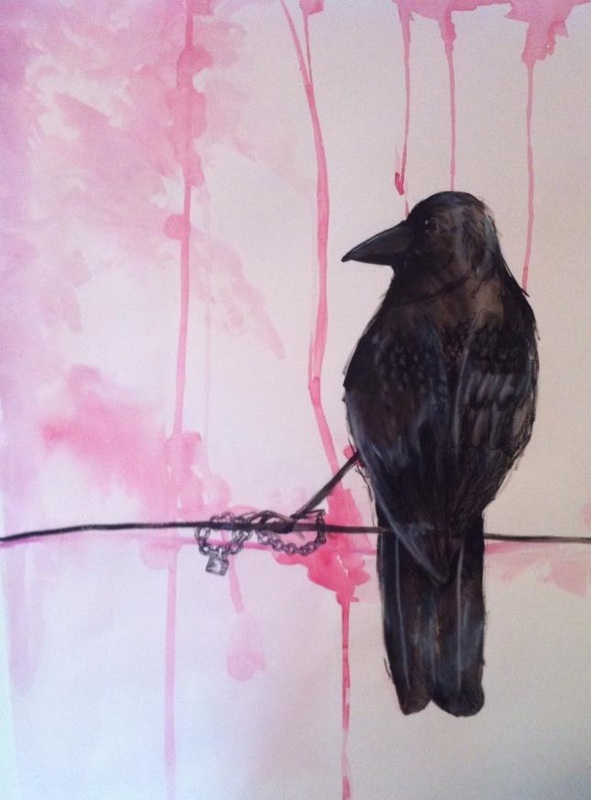 After working on my piece “Vermin”, which represented Jill as a crow chained to a power line, I began to work with the idea of death and the gamble that addicts take with their drug use. I continue to work with the imagery of the crow and the social stigma attached to the bird, but build on it by drawing the skull rather than a live bird. This not only works with the idea that addiction can potentially be fatal, but as well that the image a person presents to themselves can differ from who they are. Jill mentions how she slowly broke her own drug use boundaries. First she was only doing meth outside of work, then not on work premises, until finally addiction took hold of her life. Though she may have been able to present herself as functional and “normal” (problematic as the word may be), her overall mental and physical health was declining, hence the title of the piece. Relationships are a big part of addiction. Many addicts are hurting, maybe emotionally, maybe physically. Because of this, they look to one another to support their habits; to justify their drug use. The interviewee had mentioned other addicts in her life through all three interviews. She talked about drug dealers, she talked about the people she did drugs with. The harsh reality of addiction is that not everyone makes it into sobriety. Jill talks about how people she knew died, how some have been to prison many times. For this piece I wanted to consider the social context of addiction, and how the relationships between addicts can be fatal. 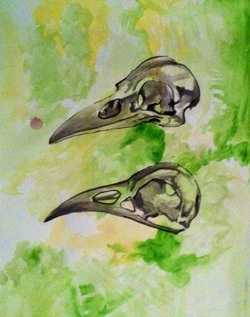 I am continuing with my imagery of the crow and the crow as a social pariah, those this time I chose to draw the skulls of the crow to be representative of the risk of addiction. This is the sister piece to “Decomposition”, which also features a crow skull. When I created the piece that came before this, “Vermin”, I was working with addiction and the freedom that can come from sobriety, but this piece and “Decomposition” are more focused on what can potentially be a very harsh reality that addicts face. I chose to use primarily green and yellow for this piece since they are colours people typically tend to associate with toxic materials, representing the toxic relationships and enablers that are present in an addicts every day life.